However, I’m not seeking to charge the batteries. What I’d like them to do is fire up the compressor on my RR47 shoreline fridge. The fridge is the important part, not the charging of batteries. In that sense, the title may be a bit misleading. The title should be, firing up the compressor on my Shoreline RR47 12V fridge, but that sounds a little boring. In order that the compressor fires and my food gets cooled, it requires a PD of around mid 12’s. Anything below 12.4V and the fridge simply doesn’t fire up. The manual claims that the fridge will be operational at 10V. This is simply not true. 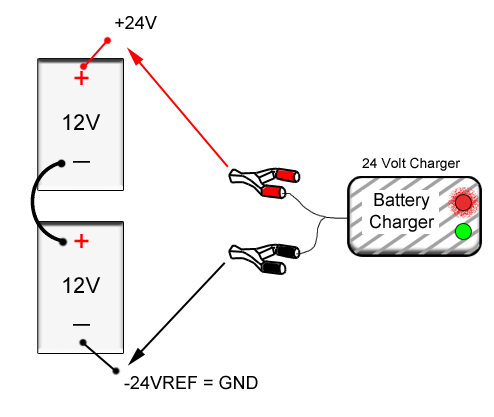 From experience, the fridge will stop working when the voltage drops below 12.4V. All I’ve done is run a wire to the battery compartment with some 3a wire, and connected it with 6mm rings to the terminals of the battery, IN SERIES. Now, I no longer have to get up and run the boat rain or shine when the fridge goes off, I can simply plug the charger in, and hey presto, working fridge. I’ve done a short video here. In the course of time, the boat will be fitted with 240V and inverters. Good to see that you’ve cracked the fridge problem – and that there’s no need for vast outlay on replacement after all. I guess that previous Bonny owners only used it when out & about, when the engine running would do the charging. On another front, have a look at this free piece of software – it’s really quite good, as a freebie.